New feature just in time for Friday the 13th! 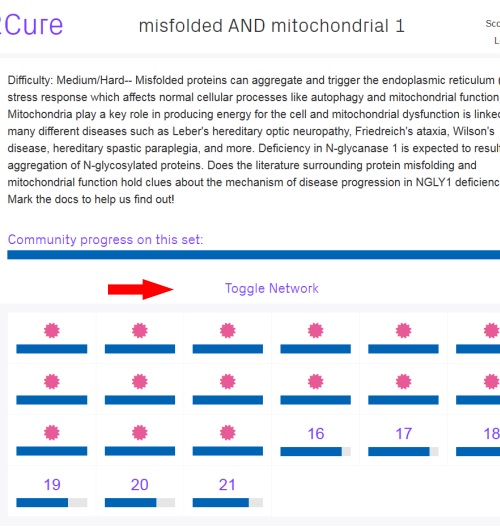 If you click on ‘Toggle Network’, you’ll be able to see the concepts that the Mark2Cure community has extracted from this doc-set. Only concepts from docs that have been marked by 15 users will appear in the network. If you want to see the network grow, help complete the quests! What does this network show? The network nodes (circles) shows the concepts that have been identified and agreed upon by 15 different users. They are color-coded based on the concept type. If there’s an edge (line) between two concepts, it means those two concepts appeared in the same doc, and are probably related somehow. Note that a big doc-set may take longer to load, and a doc-set with no completed quests will not have anything to display. What can you do with this network? Unlike the static network images we’ve generated and shared with you in previous newsletters, this one is interactive. You can use the + or – buttons, or scroll with your mouse to zoom in on the network so you can inspect its nodes (circles). You can also use your mouse to drag the network image around so that you’re inspecting the part of the network you’re interested in. See a particular node/concept term that piques your curiosity? Clicking on it will open a google search on that concept term. Want to see more nodes and edges in the network? Help complete the quests in the doc-set so that the program can find them. 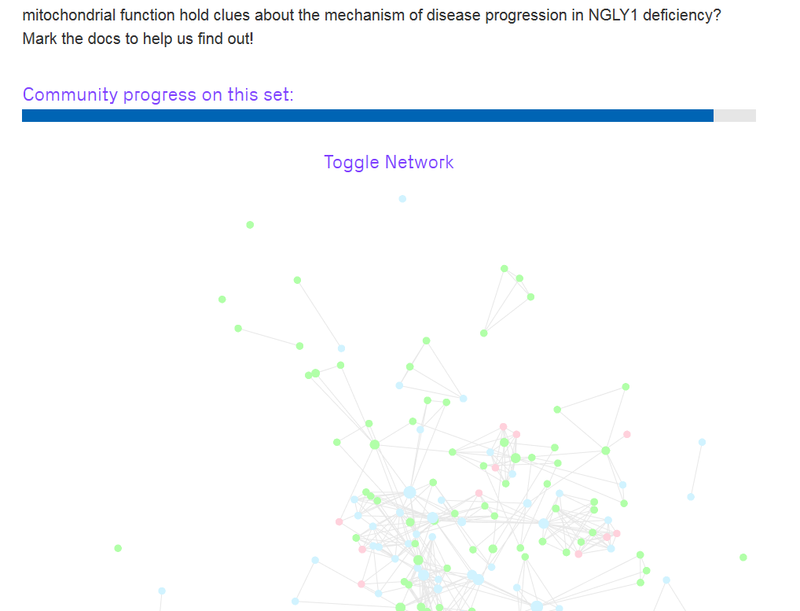 Just four quests left to go in the O-linked Glycosylation Disorders doc-set. If you have a little time to spare, please help us finish this doc-set. The Misfolded and Mitochondrial doc-set is nearing completion too! Just doing one quest will bring this doc-set that much closer to completion.